With the launch of the 2018 Winter Olympics in Pyeongchang, South Korea, State Department spokeswoman Heather Nauert is dismissing any concerns that U.S. efforts to counter North Korea's “charm offensive” could create a rift with South Korea. 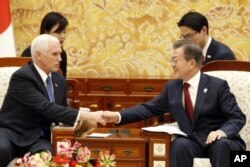 U.S. Vice President Mike Pence, left, shakes hands with South Korean President Moon Jae-in during their meeting at the presidential office Blue House in Seoul, Feb. 8, 2018. “The United States will not back away from its ally and no one is going to drive a wedge between the United States and the Republic of Korea and the United States and also Japan,” she said. Nauert said it is normal that the U.S. and South Korea sometimes approach North Korea's nuclear threat from a different mindset. “Think about the proximity of South Korea to North Korea. Think about what that country has been through. Think about the story that happened back in 1988 when a plane was exploded and South Koreans died. It is no wonder that its citizens would be naturally concerned about the threat that is right at their doorstep,” Nauert said. On Thursday in Japan, Pence made clear the U.S. wants to continue its “maximum pressure campaign” on North Korea until it abandons its nuclear and ballistic missile programs. “We also reaffirm our commitment to continue well beyond the Olympics, when the Olympics are long a distant memory, to continue to isolate North Korea economically and diplomatically,” he said. But both Pence and Secretary of State Rex Tillerson have said “we’ll see what happens” when asked if they would meet with North Korean officials on the sidelines of the Winter Games, adding that there are no meetings planned. 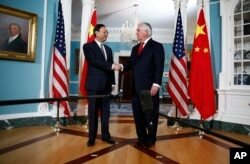 Secretary of State Rex Tillerson shakes hands with Chinese State Councilor Yang Jiechi during a photo opportunity at the State Department in Washington, Feb. 8, 2018. When asked about possible talks with North Korea, Tillerson told reporters Wednesday that the U.S.-led pressure campaign is going to continue and will get stronger. “We are not going to be lulled by the Olympic experience and North Korea marching with their South Korean, you know, friends or family or whatever, and giving them a platform to put on their charm offensive,” the secretary of state said. Some analysts have expressed concern that the tough rhetoric on North Korea could put the U.S. on a collision course with longtime ally South Korea. Abraham Denmark, director of the Asia Program at the Woodrow Wilson International Center for Scholars, told VOA that Pence is going to the Olympics to support U.S. athletes and its allies in the region, but also to keep reminding people of the nature of the North Korean regime. “So what we're coming down to is some real tension between Washington and Pyongyang about their nuclear programs but also between Washington and Seoul. Seoul wants to continue this engagement, whereas Washington has not expressed any real interest in direct engagement at this point with the North Koreans,” Denmark said. He added that he believes there is the potential for a public rupture between Washington and Seoul once the Winter Games and Paralympics end. “Where the break may really break out into the public is after the Olympics, when the United States and Seoul are set to engage in joint military exercises. And if South Korea seeks to push them back and the United States is not willing to, then that could lead to a real public break between Washington and Seoul that North Korea would probably seek to exploit,” Denmark said.